For this reason, immigrants have flocked to the country in the last two years. Chilean immigration policies are very lenient, so more than 50,000 Haitian immigrants have arrived, flooding the streets and changing the landscape of the country. Dark-skinned, Creole-speaking Haitians are street vendors, working on construction sites, and in every part of the city. When we visited three years ago, the country was as monochrome as it was when I lived there 14 years ago. As a geographically isolated swatch of land, Chile isn’t used to receiving immigrants. But the success of its economy and open doors has created a rapidly changing population. From what we’ve learned, Chileans are generally patient and kind to Haitians, who suffered such travesties from the devastating earthquake that shook their poor country several years ago. A country that was unused to people who didn’t speak fluent Spanish a few years ago has developed collective patience with people who can’t speak the language. That’s a good thing. They’re less tolerant of the Colombian immigrants who are also arriving in droves, with often nefarious motives. And the country has taken to violence with the many pickpockets and thieves–when Mr. ThreeYear and I were coming back from running errands, we saw a man savagely beating up another man, and learned he’d been stealing his tools. Because of the city’s economic success, it can be expensive to live here. We’ve seen that with the increasing value of our very small apartment. And we visited several new apartment complexes that are cropping up around the comuna, or community, where we are staying. The value of these apartments is around $135,000 US for a three bedroom, two-bath apartment in a lower-middle-class neighborhood. And in a more desirable neighborhood, they’re double or triple that price. Prices have more than doubled in the last ten years. Part of the reason real estate is so high is because buildings have to be coded for earthquakes, since this is the most seismically active country in the world, where the world’s two strongest earthquakes ever recorded have hit. It’s expensive to construct everything in concrete and steel. Food, cars, and gas are also pretty expensive, even though salaries aren’t equivalently high–the average salary in the city is about $860 US per month. Compare that to the average salary in Mississippi, one of the poorest states in the US. It’s $3,076.58 per month! While we’ve been here, we’ve been enjoying the sunshine and the pool at the apartment complex. But we’ve also ventured out to see the city. Here’s an overview of what we’ve done for food and entertainment while we’ve been here. As you’ll see, even though we’ve eaten lots of delicious food and done something fun every day we’ve been here, we’ve been able to keep our costs fairly low, and are actually spending less on food than we would be back home. That’s primarily due to…. This was my feria haul with $16 US. I bought pre-made salads, fruits, veggies, wrapping paper, and tags. My mother-in-law shops almost exclusively at the feria, because it’s a great deal and it’s so close. 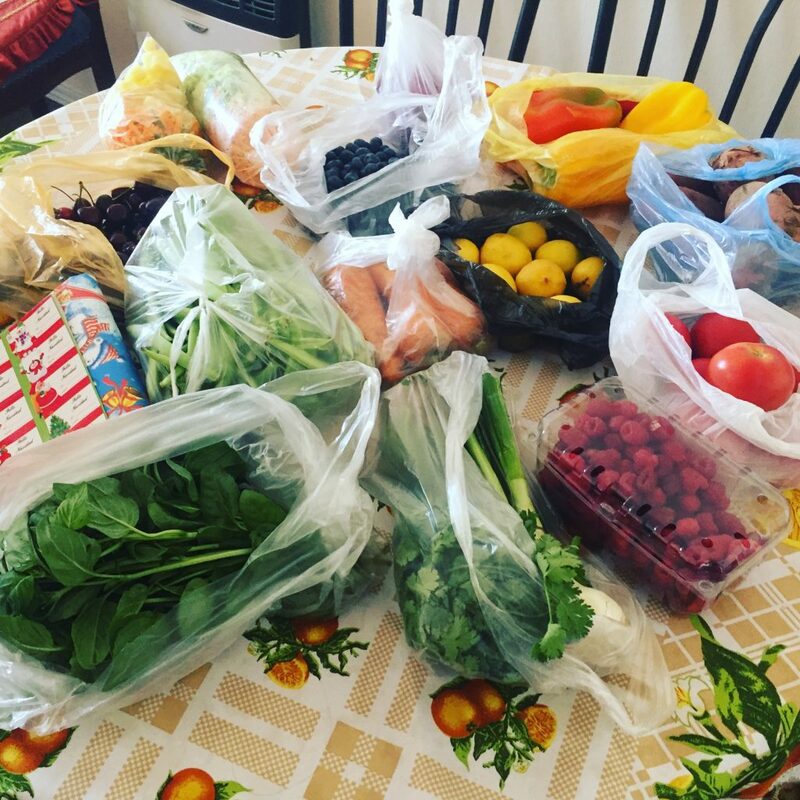 To get to the larger supermarket, she has to walk three blocks and cross a busy street, so it’s much more convenient to get everything she needs one block away. We have visited the feria each time it has been open, stocking up on fruits and veggies, and allowing the Junior ThreeYears $1,000 pesos (about $1.60 US) each to buy a toy or game. 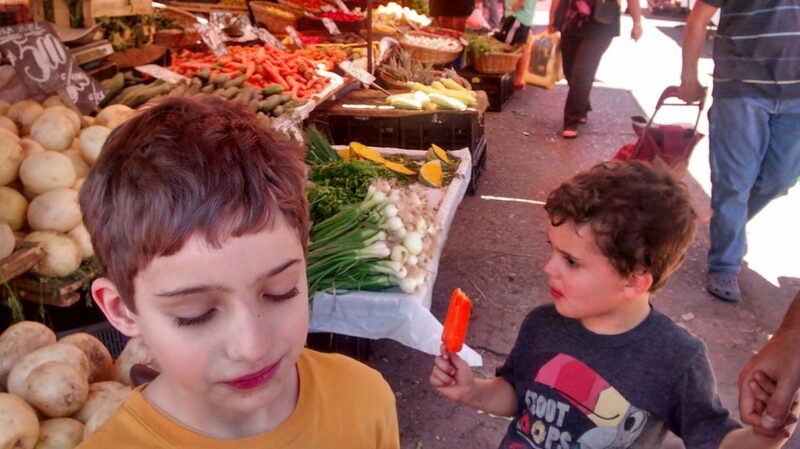 The boys on our last trip to Chile, enjoying “helados” at the feria. We generally make breakfast, which is a typical Chilean breakfast of fresh bread (marraquetas), avocado, ham, or cheese, and coffee or juice, at the apartment. Sometimes we make lunch in, or we’ll eat out if we are not in the apartment. 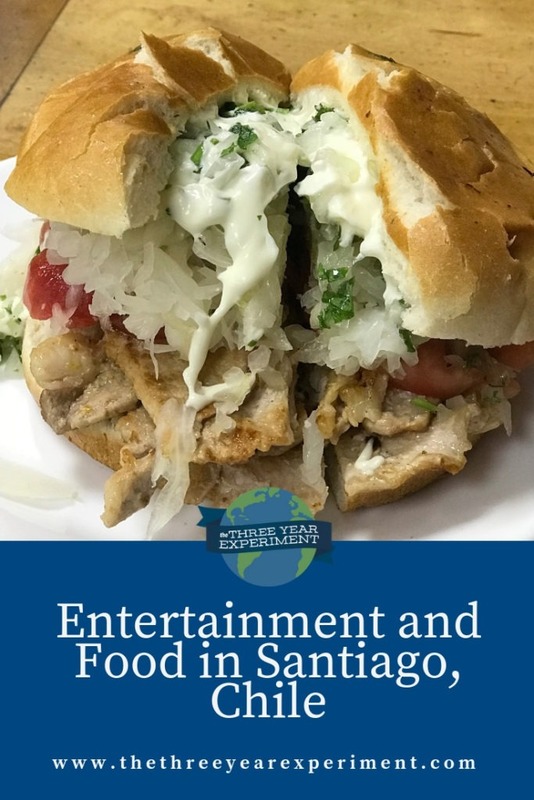 Some of the best deals on restaurant food are at lunch hour in Santiago, when you can order the lunch menu, a prixe fixe style menu with set appetizer, main course, and dessert, for a low price (generally $6 US or so). One night when Mr. ThreeYear was going out to meet friends, I got online to order sushi and was amazed at the options! First off, there was a sushi deal of 50 pieces of sushi for $19.35 US. 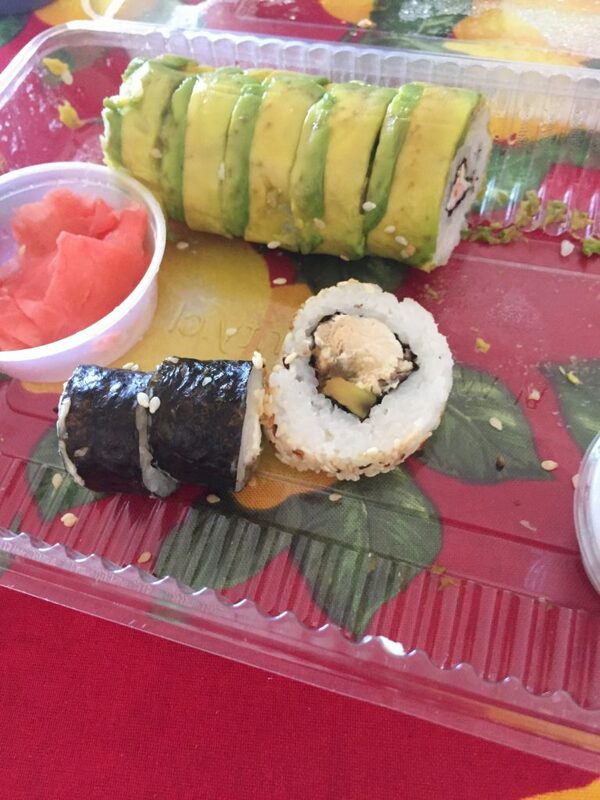 Granted, the sushi was mostly vegetarian, but delicious and enjoyable none-the-less. And the delivery fee was the incredibly cheap $.80! For less than a dollar, we had sushi delivered straight to our apartment door within 45 minutes. A company called TuPedidoYa (YourOrderNow) allowed me to sign on via Facebook. Then, I entered my address into their system, and all the possible restaurants with delivery to my area (dozens!) popped up. There was a search feature for each restaurant so I could quickly find what I wanted, and there were deals (some restaurants offered 10% off, etc). The end of our sushi dinner, which we ate for lunch the next day (I forgot to take a picture when it arrived because I was too busy noshing). We’ve also picked up lunch at a seafood place that has incredible fried fish several times and taken it to eat with my mother-in-law. For $3,000 Chilean pesos, or roughly $4.85 US, we get a huge container of fried fish, potato salad or mashed potatoes, and salad. As you can probably tell, lunch is usually the biggest meal of the day in Chile. We eat huge lunches, then keep dinner relatively light (okay, except for the sushi!). 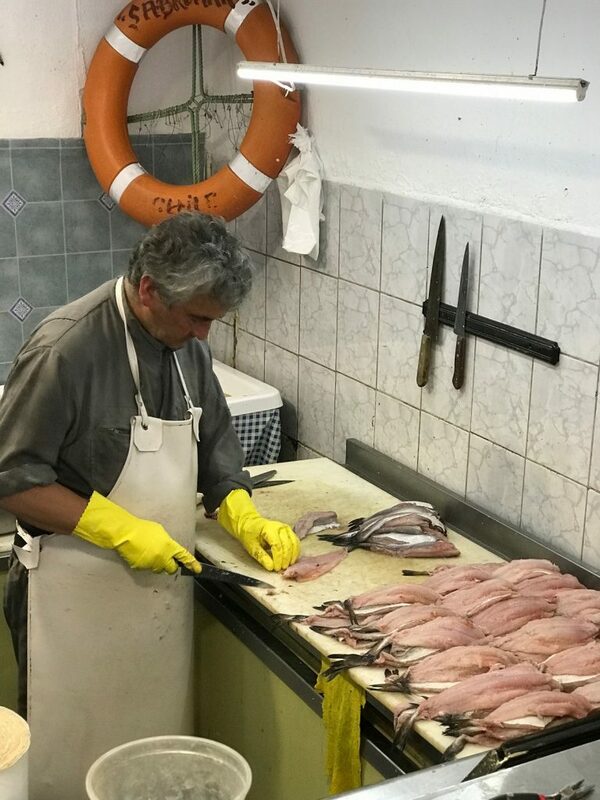 A cook at our favorite take-out lunch joint in Santiago makes short work of a pile of reineta, or pippin, fish. We’ve occasionally eaten out at restaurants. Mr. ThreeYear and I spent an entire day in tramites, or appointments, on Tuesday, to renew my national identity card, which involved waiting in the Department of Immigration for three hours (fun). We were in the center of the city and had lunch at a Peruvian restaurant, where we stuffed ourselves with aji de gallina, a typical Peruvian dish made of pieces of chicken and potatoes covered in a creamy sauce with nuts, and served over rice. We spent a fair amount on this lunch, $36 US for two people, but after all that waiting, it was worth it. Today, we’re headed to Los Dominicos, an artisan market in the north of the city, originally a convent for Dominican monks. There are tons of restaurants there, where we’ll sit outside and probably enjoy fresh salads with my favorite Chilean toppings–avocado, heart of palm, corn, and beets. Sometimes there’s even a soft, fresh, almost tasteless cheese called queso fresco. Yum. 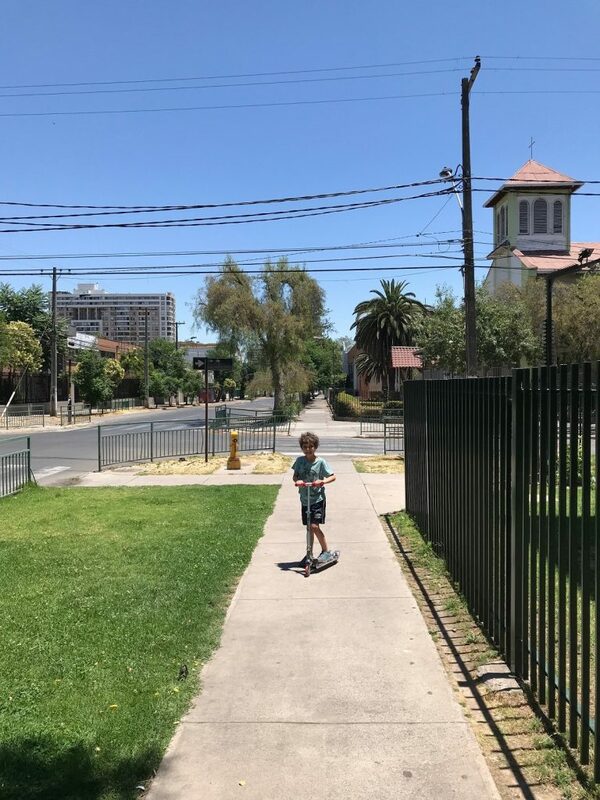 We’ve learned, over the years, that even though we’re primarily in Chile to visit family, our kids get really bored without a few activities scattered throughout the day. The boys have spent lots of time in the apartment pool, which is open all summer. 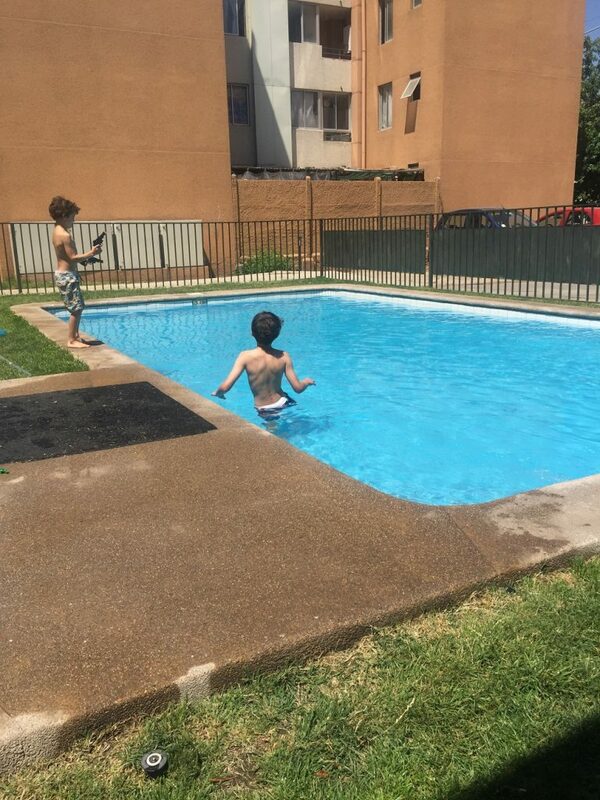 It’s a fairly small pool, but the kids love it. It’s free for residents and guests. The boys spend as much time as we let them swimming in the pool in the apartment complex. Little ThreeYear also got a scooter from Santa Claus, so that has also provided tons of entertainment. Who knew that walking to the corner store to buy soda could be so much fun? The boys have invented a game where they scooter up a section of sidewalk by the pool and see who can get the farthest. This has led them to learn their fourth Spanish word, cuidado, or “careful,” for when someone walks by. (Yes, they only speak four words of Spanish. We know we are terrible language teachers. We have heard the lecture from fifty people at this point). Despite our free entertainment options, every other day or so, we take the boys to do something outside of the house. It gives everyone a change of scenery and seems to be just about the entertainment rhythm we need–one day relaxing at “home,” the next day exploring the city. The Museo Interactivo Mirador, or MIM, is located a ten-minute Uber ride away (more about Uber in my post on transportation). It’s an interactive children’s museum spread out over three buildings. We went on Wednesday, and got a happy surprise: half priced entrance tickets. We paid $10.70 for the four of us, which was a spectacular deal, given the hours of entertainment it provided. 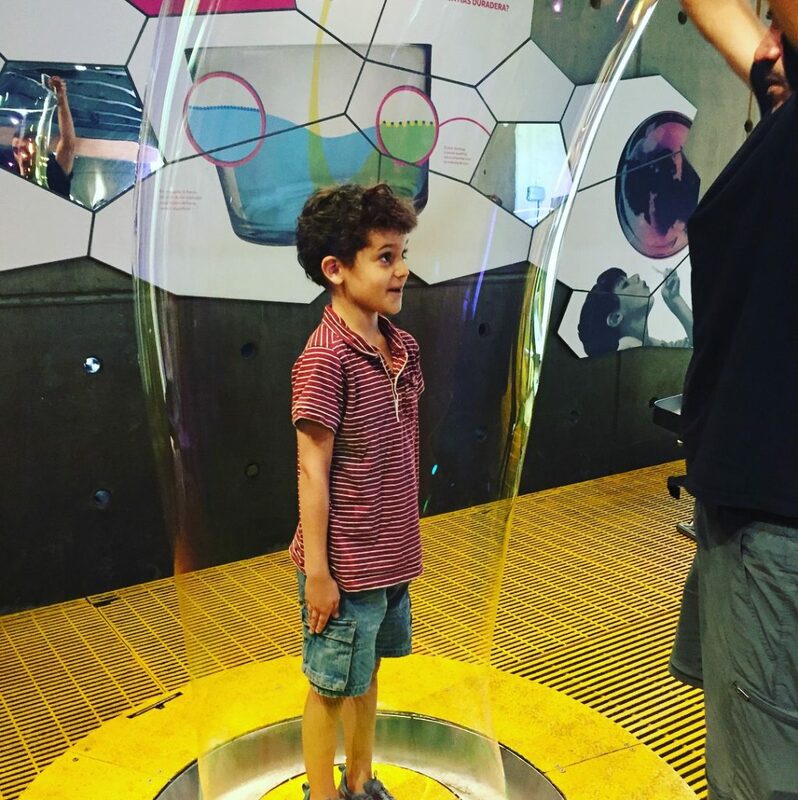 In addition to outdoor exhibits, which we didn’t stay at long because it was so hot, the museum has exhibits on sound, electromagnetism, construction, simple machines, and more. Little ThreeYear spent time in a construction exhibit designed for smaller kids, and operated a crane and built with “bricks.” Junior ThreeYear used a real printing press and created a poster he can take back home with him. Since we spent most of the day in the apartment yesterday (although we did go see the new Star Wars movie–it was sooo good), we’ll spend today on another adventure. This time, as I mentioned, we’re heading to Los Dominicos artisan fair. We’ll shop for some small trinkets to bring home to friends and family, and enjoy the collections of animals that are there. 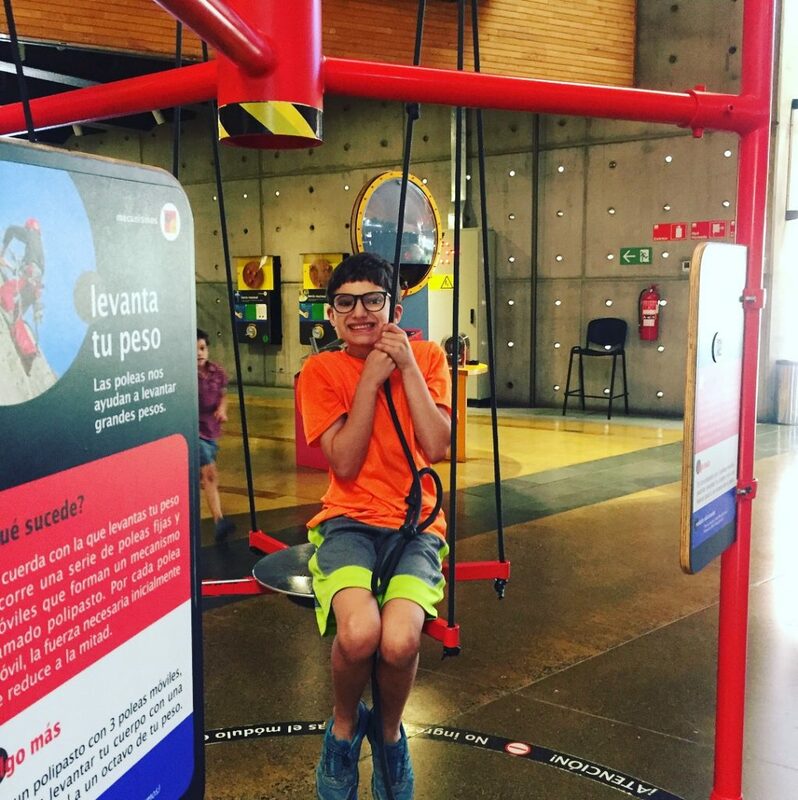 We also plan to show the boys the tallest building in Santiago, the Gran Torre Santiago, which is part of a huge mall called the Costanera Center. It’s 261 meters, or 861 feet, tall. 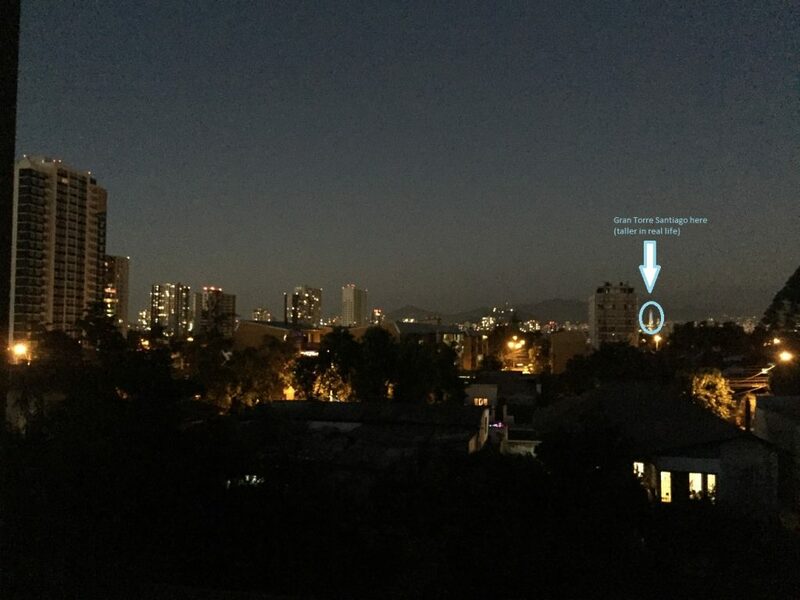 We can actually see it from our apartment, which is very, very far away. We also plan to visit Cerro San Cristobal, a hill in the middle of the city. From the top, which you can get to by tram, there are amazing views of the whole city on clear days. You can also taste Chile’s favorite summer drink, mote con huesillos. The huesillo is a peach, with the pit inside (although nowadays, it’s usually pitted) and mote are strange, chewy grains of husked wheat, all covered with a super-sweet, syrupy juice. Ugh. I mean, yum! (Like many regional delicacies, mote con huesillo is an acquired taste). 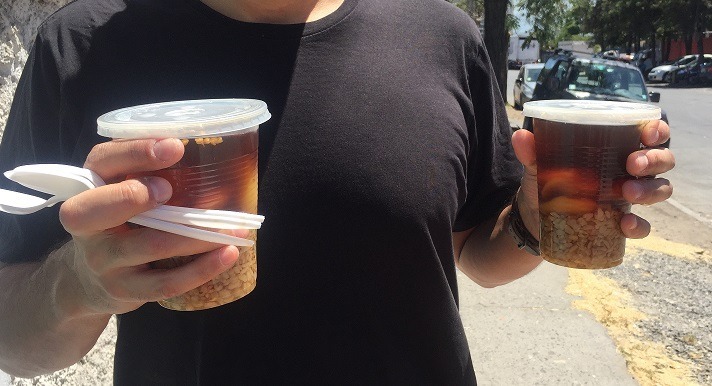 Mr. ThreeYear, holding two cups of delicious mote con huesillo. We still have almost one more week in the city, before we head back to (currently -10 degrees F) cold temperatures and several feet of snow in New Hampshire. So I’ll be back with more updates soon. Hope you’re enjoying the last days of 2017. See you in the new year! Good thing you’re down there right now-it’s so cold here! Looks like a ton of fun. I’ve been looking at your pics on Instagram and think that Chile looks like a wonderful place. Have a great time on the rest of your trip! Oh wow this brings back memories! I lived not too far from Los Dominicos during my semester in Santiago, and going there and up Cerro San Cristobal were two of the first things I did when I got there.